Simran and I are both big fans of the one-bowl supper. They’re so great for repurposing leftovers and work well for packed lunches the next day too (leftovers of leftovers, the gift that keeps on giving!). In this version we’ve layered rice (but you could use any leftover cooked grain) with a tasty chorizo-bean saute, and a super quick, semi-homemade avocado salsa. Add shredded carrots, chopped lettuce, diced tomatoes or whatever else you have on hand and your “what’s for dinner?” problem is solved. By the way….. I recently discovered soy chorizo which is pretty fabulous. Have you tried it? I am not always a fan of “stand in” products but in this case it’s a substitution that really works. Soy chorizo has that same great punch of flavor as the traditional meat variety and cooks up with a similarly pleasing crumbly texture. Great option for a meat-free supper. 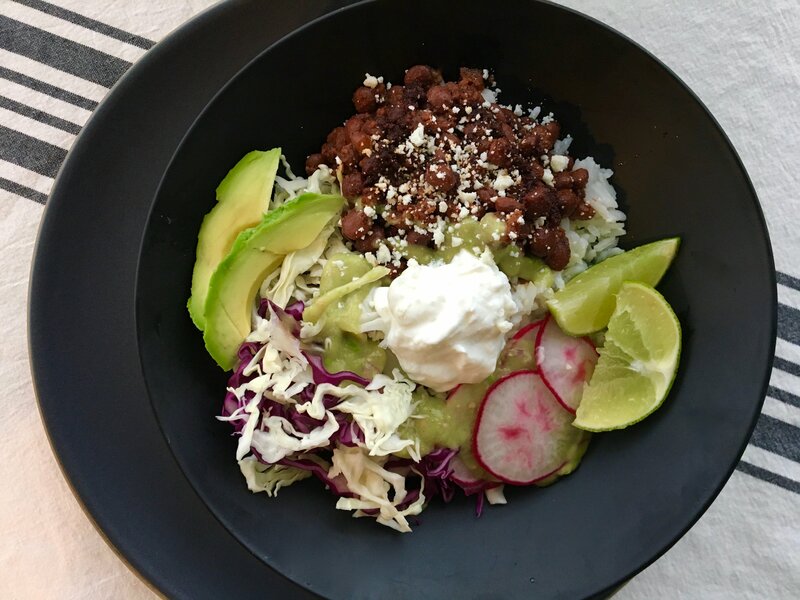 You can find our recipes for bean-chorizo saute and the quick avocado-salsa in the “Fast and Furious Weeknight Cooking” column in the San Jose Mercury News.